Hmm….a ‘breast navigator’? Really? Well, I can honestly say that I never thought I would ever need someone in my life with that actual title, lol! In fact, I never even knew such a title existed until yesterday. Thank goodness I still have some humour remaining! When I Googled the job title, it said: Breast health navigators are available to answer questions concerning breast health, provide education and support, coordinate care as needed, and prepare breast cancer patients for survivorship. There we have it. I think I was relieved? It is a funny thing when you walk into the hospital for your Bone Scan and run into not only your sister, who has been a long-time nurse there and works a great deal on the Oncology floor, but also two great friends – one of who is the head dietician there and the other who is now Director or Surgical Services, lol. Interesting also, that the latter two have both ‘survived’ breast cancer in the past couple of years and all have been a fountain of information over the past 24-hours+. It was while I was conversing later with one of them that I was told I would be assigned a Breast Navigator – which I truly found amusing. 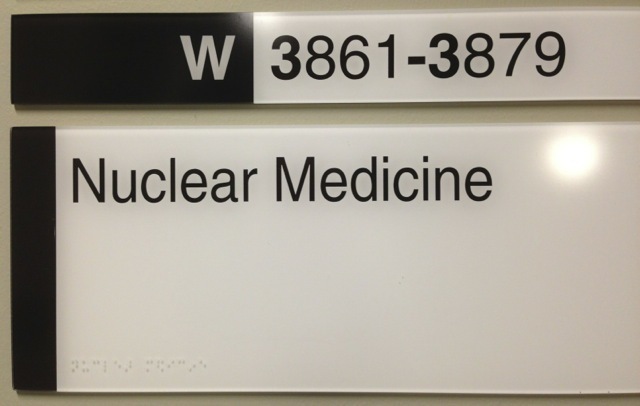 As I walked through the doorway with the label Nuclear Medicine on it, I had to stop and take a photo, as it almost seems like an oxymoron – does it not? I mean, to have these two words used together just makes me shake my head. I obtained virtually no sleep the entire night before the scan, as I’m not comfortable in confined spaces at all. Thus, I was quickly relieved that the machine was not enclosed at all, but open on the sides – with room for escape if needed. I laid down, got strapped in and closed my eyes, envisioned holding my arms open wide in front of the ocean and breathing in all its energy and strength. This is the vision that will get me through the next many months ahead and I will hold on to it with every ounce of my body (even as those ounces seem to be falling off me). They called yesterday afternoon to report that my results were negative – no cancer had entered my bones – YAY! Test #1 ‘passed’ with flying colours :-). Next up is the CT scan Friday afternoon. Hopefully the results will come back quickly as well, and have the same positive outcome. Then, I can just focus on getting these monster-bumps out of me, ridding my body of any residue and getting on with living life! This entry was posted in Uncategorized and tagged bone scan, Breast Navigator, CT scan, Denise MacDonald. Bookmark the permalink. 8 Responses to A Breast Navigator? Yes indeed! Miss you gf!! Karen and I are ecstatic that there is no cancer in the bone!!!! Love you! Miss you!! Think of you quite often!! Thank you! Love and miss you too! Great news about your beautiful bones! Keep the vision of the ocean. Use that image with your affirmations. These test results show that you need not fear this exprience. Good things are happening. Keep positive thoughts flowing. CANCEL, CANCEL, CANCEL any thoughts that are not working for you. Thank you John for your wonderful words of wisdom :-). Always appreciated!